Monday – Ran 1 mile and then did some yoga from P90X3. Tuesday – Ran 3 morning treadmill miles. Wednesday – Ran the virtual #EarnYourTurkey 5 miler from Running on the Wall and had a good fast run. Always earned, never given is a great saying. I really loved how this virtual race came with a medal holder! Such awesome swag! 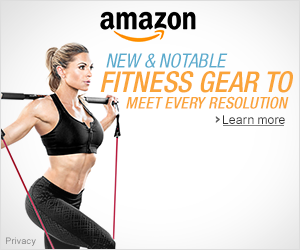 Thursday – I tried 21 Day Fix Extreme Dirty 30 workout. My little guy joined in for a little bit. This was a tough one and I liked how it used weights. I was sore the next day. I also ran a mile to continue the run streak. Friday – I ran a nice 5 miler while the kiddos were in school. Saturday – Got 7 afternoon miles on the treadmill. Sunday – Ran one mile to continue the streak. 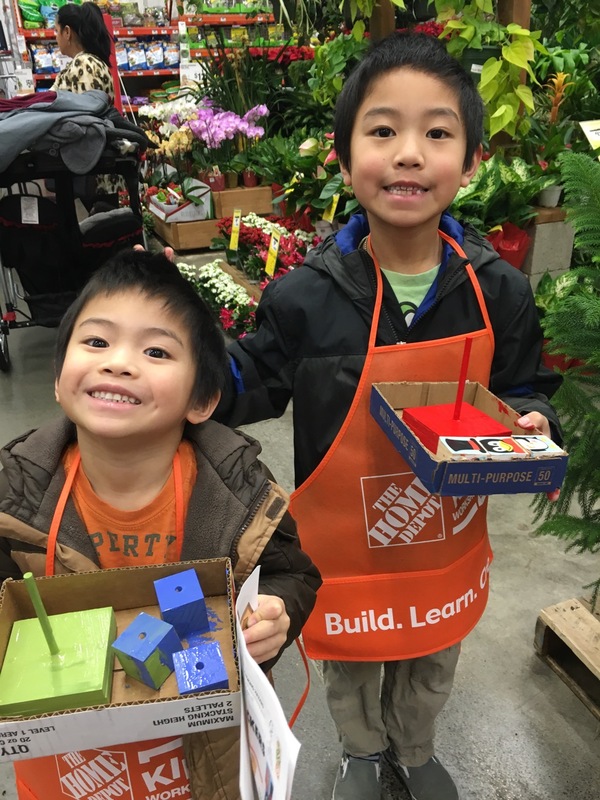 A fun thing my kiddos did this weekend was go to the Holiday Stackers Workshop for Kids at Home Depot. I love how they have this free activity for kids to do. 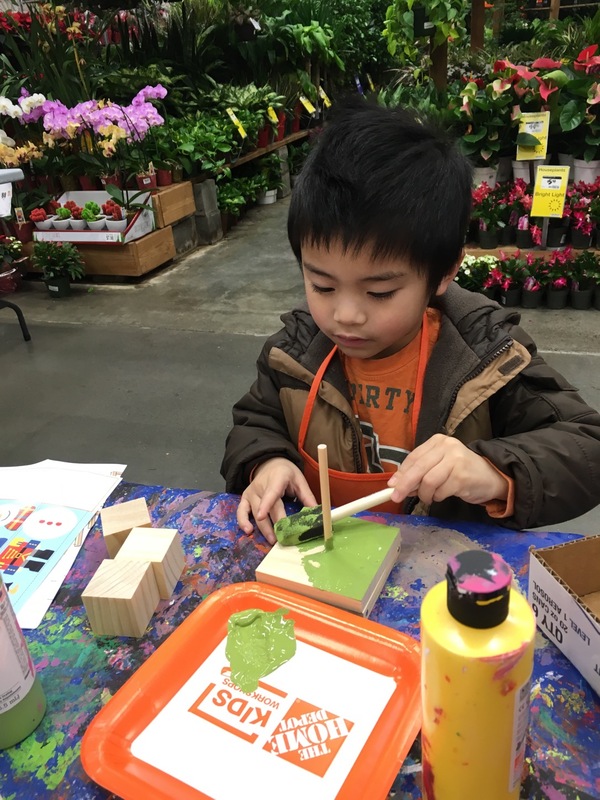 This was my first time going to the Home Depot workshop. Lowes has a similar program. I like how they were able to use paint to decorate the stand for the blocks. The kiddos enjoyed it. I’ve already signed them up for the next event in January, which is a Kung Fu Panda 3 Spinning Box one. 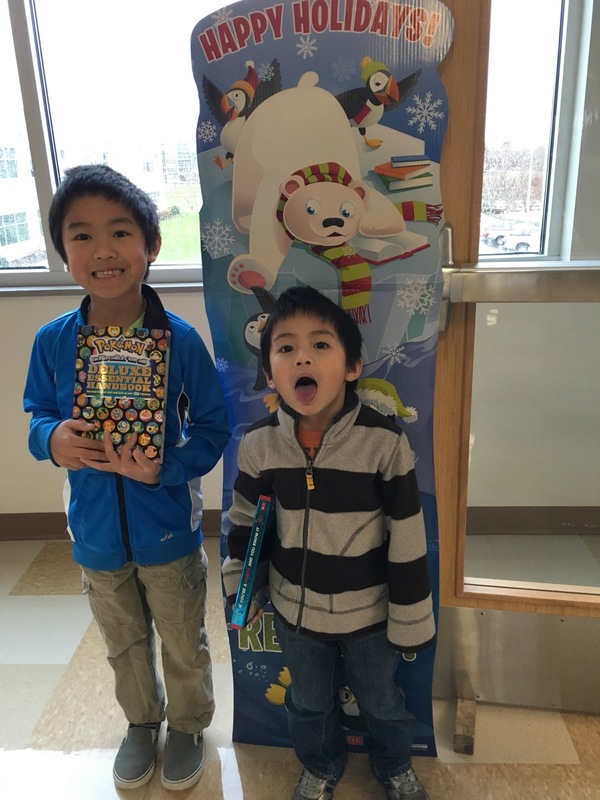 We also went to my kiddo’s elementary school for their holiday bazaar and book sale. I ended up buying some books. 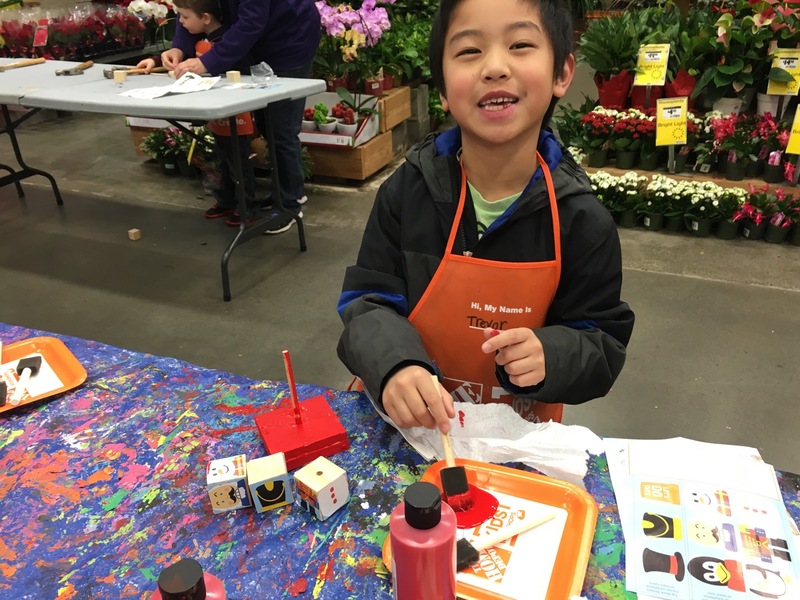 Martin took our grandson yesterday to Home Depot to make the same thing! He enjoys it so much (both of them). His Home Depot apron is filled with so many pins. He never misses a month and last week they added an extra one for Thanksgiving week I guess. It is a really cool thing for the kids to do. I know I always say this but your kids are adorable! Great workouts this week and you really ran a super fast 5 miler! I seem to run way slower on my virtual races then I do on live races. I will try to improve that this month! Enjoy the week ahead Sherry! That’s awesome that Martin has been taking your grandson each month! Such a fun activity! Thanks Diane! Love the virtuals so far and pretend they’re a race. Hope you’re having a great week! When my boys were in grade school, I was such a sucker for those book fairs. I love books! Now the boys don’t like to read. How did that even happen? Looks like a great week of training! Haha, maybe no time. I love books too but just haven’t had much time. I’m glad the kiddos are loving their books! Thanks Wendy! Looks like another great week! We missed the Home Depot thing, maybe we’ll get to the next one! Great job on the streak! I unfortunately had to break it yesterday with 6 year old being sick. I’ll try again next time! Thanks Sharon! Next time! Sorry to hear he was sick! Love love the virtual sway of a race holder that is really neat! You had great workouts and congratulations on your 102 miles for the month! Way to go and way to streak so far! Thanks for linking up with us! Good luck in our giveaway, what would you use the $75 for? Yourself or your boys? 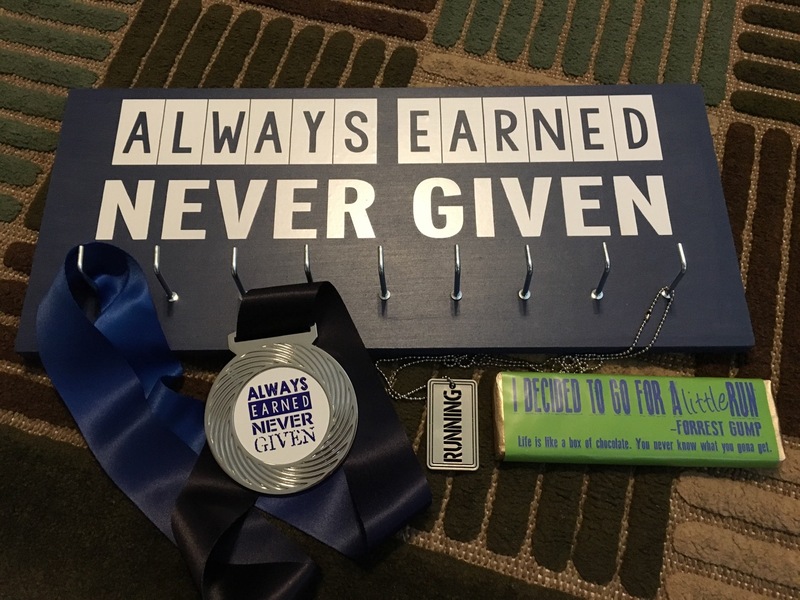 I can’t believe you got that awesome medal holder as part of your swag. I’ve never seen that! Our Home Depot has a party room. My grandson had a birthday party there and loved it. That was the first time I’d heard about it. The holiday activities sounds fun too. Congrats on the 100 miles and the streaking. I appreciate you linking with us, Sherry! I hope you have a wonderful week. Yes, such awesome swag! I didn’t know Home Depot does birthdays too. Thanks Holly! Thanks again for the cool linkup and hope you’re having a super week too! Great week of running! Congrats on reaching your mileage goal in November and continuing to go strong on your streak! That looks like a fun trip to the Home Depot. I love the Book Fair! I always wind up spending some money from my teacher account for new books for my classroom. Thanks Debra! I’m happy that I reached my goal!